When I sit and talk to my grandmother, one conversation always leads to another. I was mentioning to her that the Queen of England had recently been offended by Barack Obama because he had mistaken the British national anthem (God Save the Queen) for ambiance music and started his speech in the middle of it. Annoyed, the Queen didn't blink till the last notes of the anthem. Ins't it a total Pet Shop Boys moment? My grandmother was startled and defended her President. "Why didn't they prepare him better?" she asked. She then laughed and remembered a story that had occured with my grandfather, many years ago.
" It was your grandfather's first session with the Shah. We had ironed his shirt, his suit was pressed and his shoes had been shined. He then took the bus. - "He took the bus to visit with the Shah?" - "It's funny" I added, "my husband and I have made it a tradition to always celebrate our wedding anniversary at our favorite restaurant, the Auberge D'Onex, in Geneva. It is always a treat but it is expensive so we go very rarely. 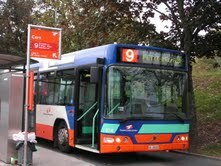 It happens to be a long bus ride away, but why take a cab when it is so expensive in Geneva? Once, when I asked the bus driver for the stop to the restaurant, he responded " are you going to work at the restaurant or eat there?" I was being penny wise, pound foolish by taking the bus to such an expensive restaurant. - "So your grandfather arrived on time", she said. He sat in the anti-chambre and waited two hours before meeting the Shah.He was led into the room, where he bowed his head in respect, and then he had his conversation with the King of Iran. When the meeting was over, he shook the Shah's hand, turned and left the room. As soon as he left the King, your grandfather was assaulted with criticism. How had he the gull to shake the sovereign's hand and worse even, how could he turn his back to the King and leave the room, instead of walking backwards to the door? - You had me waiting for two hours and none of you ever mentioned what I was supposed to do or not do. Do you think I meet the King daily and know how to act? Why don't you teach protocol classes? Obama may have thought the same after the national anthem fiasco.